Below is the 2018 season recap for the Baltimore Ravens. The Baltimore Ravens won the AFC North at 10-6 after a 4-5 start as rookie quarterback Lamar Jackson led a revamped offense and the defense proved to be one of the league’s best. Rookie running back Gus Edwards emerged as one of the surprises of the season, finished with an 80.8 overall grade while averaging 5.2 yards per carry and 3.2 yards after contact per carry. 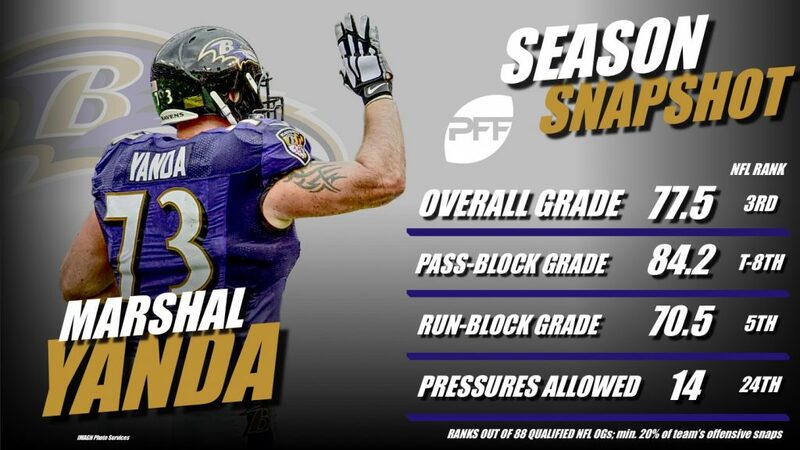 Guard Marshal Yanda was back and healthy, starting all 17 games while finishing with the third-best grade among guards at 77.5 during the regular season. The secondary was one of the league’s best, anchored by second-year cornerback Marlon Humphrey who ranked 10th among corners with an 81.6 coverage grade and veteran safety Eric Weddle who posted a solid 77.9 overall grade. 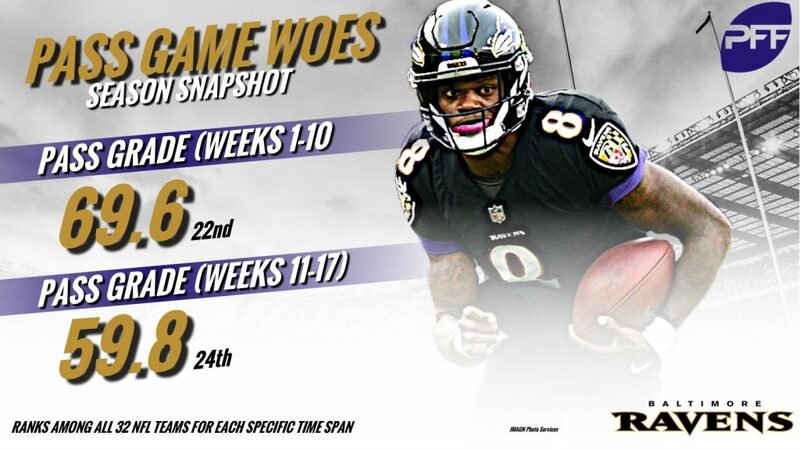 The passing game was one of the worst in the league, whether it was Joe Flacco under center or rookie Lamar Jackson who took over in Week 11. The Ravens finished 22nd in PFF passing grade and 26th in receiving grade on the year. The revamped pass-catchers disappointed with Willie Snead posting the highest grade among the receivers at only 67.1. 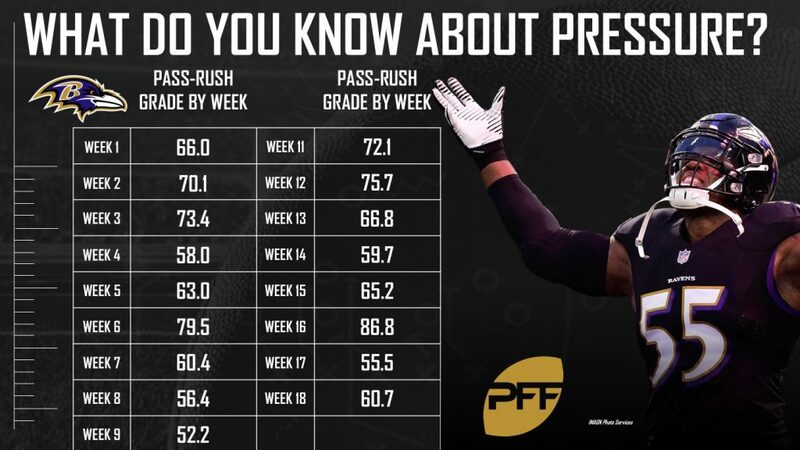 Baltimore’s pass rush was improved, but inconsistent, as they had nine games with a PFF pass-rush grade under 65.0, including six of their seven losses. 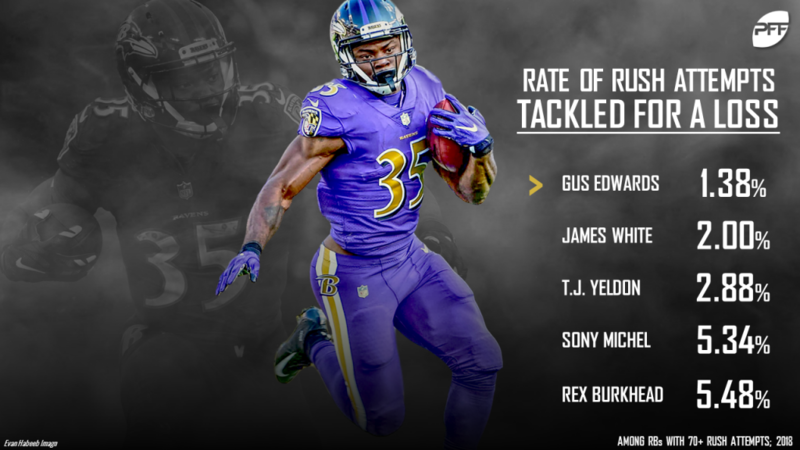 Rookie RB Gus Edwards was the highest-graded player on offense and Baltimore’s breakout player as his production took off once Lamar Jackson took over under center and the Ravens became the most run-happy team in the league. His 80.8 overall grade ranked fifth among rookie runners. 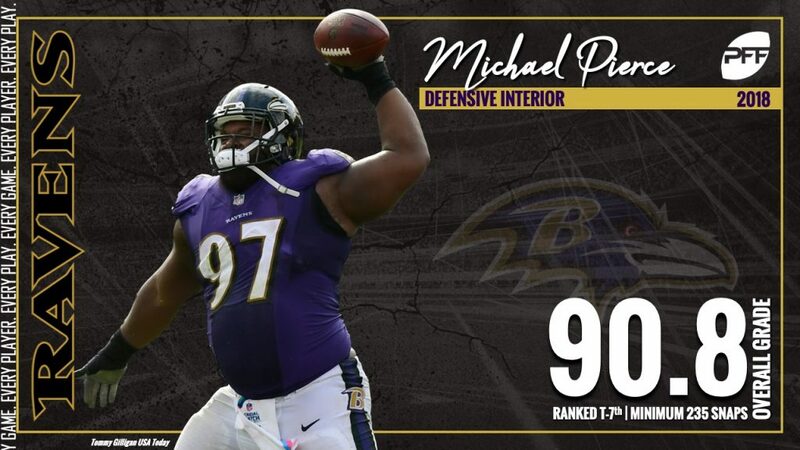 Interior defensive lineman Michael Pierce posted the top defensive grade at 90.8 overall, good for seventh in the league. He did his usual fine work in the run game, grading at 91.8 to rank fourth in the NFL. 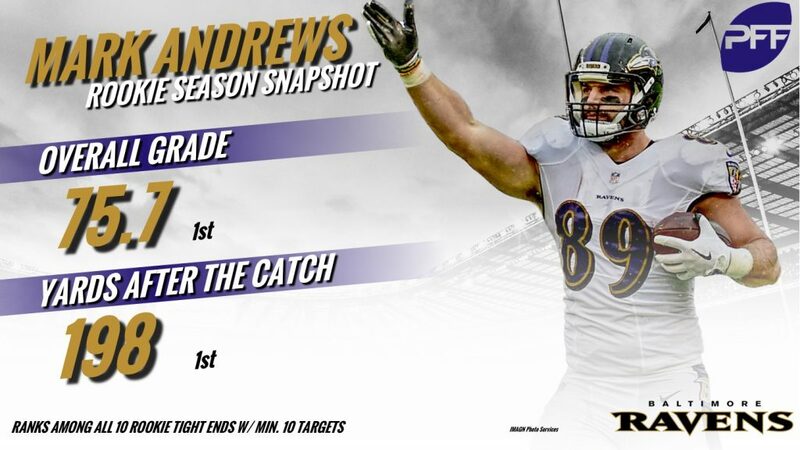 Another key rookie was Mark Andrews who led all rookie tight ends in overall grade at 75.7 and receiving yards with 552. The Ravens took their run-heavy, defense-laden approach to an AFC North crown, and they’ll look to build upon their success in the second year with Lamar Jackson under center.